I am a huge fan of the American IPA style of beer, and even though there are thousands of breweries in the US who produce thousands of American IPAs, I can sit and drink them all. I might not enjoy them all, but I will definitely drink them. Each brewery makes their versions different based obviously on ingredients such as the malts, yeast, and of course the hops, which brings the flavor of the American IPA to the front. On this particular day, I was drinking dark ales, and I wanted something hoppy, so I went to BEER3PO (my large beer fridge) and found this little guy in there! I poured this IPA into one of my first pint glasses which is a Shiner Bock pint glass. Poured a nice copper color with a finger width off white head, which stuck around a bit, and left a little lacing down the glass. The hops are definitely present up front in the smell of this beer. There is a floral, piny, but mostly citrus aroma that hits the nose right away. After a few sniffs, there is a slight tingly spice that lingers in the nostrils for a bit. They use Cascade, Glacier, and Warrior Hops in this beer, which are all present in this explanation of the smell for sure! I did get a nose full of the malts, but only after I went smelling for them. The smell of caramel, or biscuit are not strong, but present. Seriously though, this is an American IPA, and the Hop aroma is probably what most will smell, and leave it at that! The taste of citrus is again, right up front here, but there is a bit of funkiness going on here. There is a bite here that leaves a slight taste of skunk, or a body odor like taste. I know, I know..that sounds gross, right? Trust me when I say this is a some what typical taste with IPAs. It’s really hard to explain what I mean, but I know I am not the only one who compares this particular taste to the description I used. 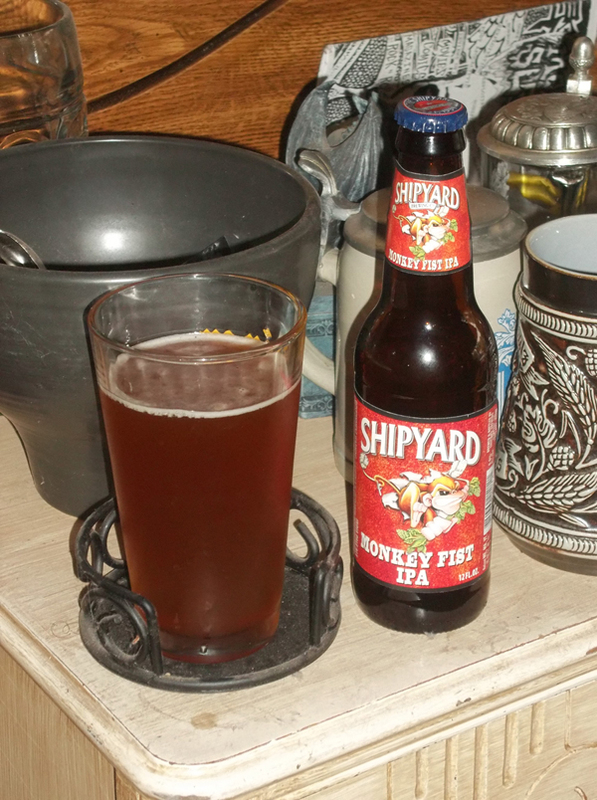 There is a good balance of mixing these Hop flavors with the present malt flavors like caramel, or a buttery biscuit, which is something Shipyard prides itself on this beer. The body is medium, and easy to drink. Just remember though, this one will leave a spice in your nose, and in your throat for a bit after drinking. Well worth it for Hop Heads, though! The first band that came to mind when deciding on who to pair this beer with was England’s own IRON MONKEY. They split up in 1999, but not before releasing two awesome full length albums, an EP, and a split CD with Church of Misery. I chose an older song from their debut self titled album awkwardly titled “Shrimp Fist.” So we have the word Monkey in the band name, and the word Fist in the song title. I think it fits perfectly here. Check out this band, and please check out beers by Shipyard Brewing Company if they are sold in your area. DO NOT let the references I used above scare you off. I wish I could explain it better to you. Trust me!